Teams put their analytics skills to the test and compete at DataFest 2018. Registration has officially opened for Miami's 4th annual DataFest competition! You can now sign up with your friends to participate in Miami's only data analytics contest which will run April 5-7 this year. 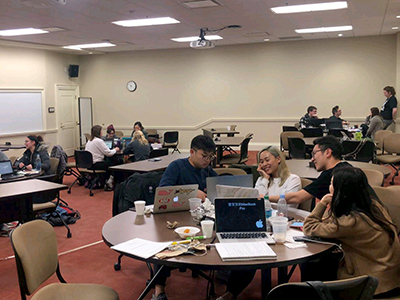 DataFest, which is hosted at Miami by the Center for Analytics and Data Science (CADS), is an event where teams of 3-5 students compete to sort through, organize, and analyze a set of data given to them at the start of competition. Groups work around the clock over an entire weekend to interpret the data using their analytical, creative, and collaborative skills. At the end of competition, they present their findings to a panel of judges in the analytics industry who select first, second, and third place finishers. Those who place receive cash prizes of $1,000, $750, and $500, respectively. First held at UCLA in 2011, DataFest is a national phenomenon presented by the American Statistical Association at many colleges throughout the country, including the University of Southern California, Duke University, Dartmouth, and Princeton. Last year 173 students participated in Miami's edition of the event, including students from Bowling Green State University, Xavier University, Northern Kentucky University, University of Dayton, College of Wooster and the University of Cincinnati. 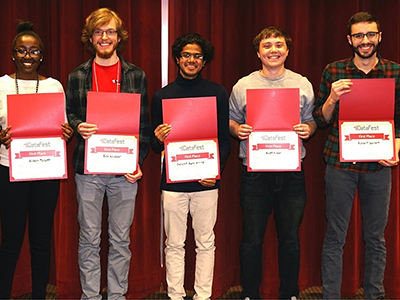 The 2018 DataFest winners were Robert Garrett, Austin Nar, Alison Tuiyott, Bob Krueger, and Sanchit Ram Arvind, who formed the team "ANOVA One Bites the Dust." This past summer, Garrett and Nar expanded on their work, using their findings at DataFest to create an R Package that can manipulate and visualize spatial data. No analytics experience is necessary for the event. Students will be provided with meals, snacks and DataFest merchandise for participation. Procter & Gamble serves as the event's presenting sponsor, with Worldpay and Charter Communications also sponsoring; industry graduates and professionals representing CADS Corporate Partner will be in attendance as consultants. CADS is dedicated to connecting students and professionals in the world of data science. The organization facilitates projects involving analytics that students across a variety of fields work on for corporate and public partners. In addition, CADS hosts career fairs and professional networking events where students can talk to potential employers. The work of CADS, including DataFest, wouldn't be possible without its generous partners: Allstate, Cardinal Health, Cleveland Clinic, Express Scripts, EY, Fifth Third Bank, Kroger Technology, The Sheskey Family Foundation, and Worldpay. The registration period for DataFest closes March 15, so make sure you get your team together soon!